For vitamin C, see ascorbic acid. Citric acid exists in greater than trace amounts in a variety of fruits and vegetables, most notably citrus fruits. Lemons and limes have particularly high concentrations of the acid; it can constitute as much as 8% of the dry weight of these fruits (about 47 g/l in the juices). [a] The concentrations of citric acid in citrus fruits range from 0.005 mol/L for oranges and grapefruits to 0.30 mol/L in lemons and limes. Within species, these values vary depending on the cultivar and the circumstances in which the fruit was grown. In 2007, worldwide annual production stood at approximately 1,600,000 tons. More than 50% of this volume was produced in China. More than 50% was used as an acidity regulator in beverages, some 20% in other food applications, 20% for detergent applications and 10% for related applications other than food, such as cosmetics, pharmaceutics and in the chemical industry. Citric acid was first isolated in 1784 by the chemist Carl Wilhelm Scheele, who crystallized it from lemon juice. It can exist either in an anhydrous (water-free) form or as a monohydrate. 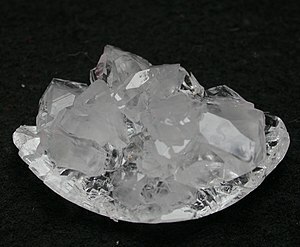 The anhydrous form crystallizes from hot water, while the monohydrate forms when citric acid is crystallized from cold water. The monohydrate can be converted to the anhydrous form at about 78 °C. Citric acid also dissolves in absolute (anhydrous) ethanol (76 parts of citric acid per 100 parts of ethanol) at 15 °C. It decomposes with loss of carbon dioxide above about 175 °C. On the other hand, the pH of a 1 mM solution of citric acid will be about 3.2. The pH of fruit juices from citrus fruits like oranges and lemons depends on the citric acid concentration, being lower for higher acid concentration and conversely. Citric acid can be esterified at one or more of the carboxylic acid functional groups on the molecule (using a variety of alcohols), to form any of a variety of mono-, di-, tri-, and mixed esters. Because it is one of the stronger edible acids, the dominant use of citric acid is as a flavoring and preservative in food and beverages, especially soft drinks and candies. Within the European Union it is denoted by E number E330. Citrate salts of various metals are used to deliver those minerals in a biologically available form in many dietary supplements. Citric acid has 247 kcal per 100 g. The buffering properties of citrates are used to control pH in household cleaners and pharmaceuticals. In the United States the purity requirements for citric acid as a food additive are defined by the Food Chemicals Codex, which is published by the United States Pharmacopoeia (USP). Citric acid is widely used as an acidulant in creams, gels, and liquids of all kinds. In its use in foods and dietary supplements, it may be classified as a processing aid if the purpose it was added was for a technical or functional effect (e.g. acidulent, chelator, viscosifier, etc...) for a process. If it is still present in insignificant amounts, and the technical or functional effect is no longer present, it may be exempted from labeling <21 CFR §101.100(c)>. Citric acid is commonly used as a buffer to increase the solubility of brown heroin. Single-use citric acid sachets have been used as an inducement to get heroin users to exchange their dirty needles for clean needles in an attempt to decrease the spread of HIV and hepatitis. Soldering Flux. Citric Acid is an excellent soldering flux, either dry or as a concentrated solution in water. It should be washed off after soldering, especially with fine wires, as it is mildly corrosive. It dissolves and washes off quickly in hot water. In materials science, the Citrate-gel method is a process similar to the sol-gel method, which is a method for producing solid materials from small molecules. During the synthetic process, metal salts or alkoxides are introduced into a citric acid solution. The formation of citric complexes is believed to balance the difference in individual behavior of ions in solution, which results in a better distribution of ions and prevents the separation of components at later process stages. The polycondensation of ethylene glycol and citric acid starts above 100ºС, resulting in polymer citrate gel formation. ^ a b c d e f g "citric acid". chemister.ru. ^ a b c d e f Sigma-Aldrich Co., Citric acid. Retrieved on 2014-06-02. ^ "Data for Biochemical Research". ZirChrom Separations, Inc. Retrieved January 11, 2012. ^ "Ionization Constants of Organic Acids". Michigan State University. Retrieved January 11, 2012. ^ Apleblat, Alexander (2014). Citric acid. Springer. ISBN 978-3-319-11232-9. ^ Lotfy, Walid A.; Ghanem, Khaled M.; El-Helow, Ehab R. (2007). "Citric acid production by a novel Aspergillus niger isolate: II. Optimization of process parameters through statistical experimental designs". Bioresource Technology. 98 (18): 3470–3477. doi:10.1016/j.biortech.2006.11.032. PMID 17317159. ^ Berovic, M.; Legisa, M. (2007). "Citric acid production". Biotechnology Annual Review Volume 13. Biotechnology Annual Review. 13. pp. 303–343. doi:10.1016/S1387-2656(07)13011-8. ISBN 9780444530325. PMID 17875481. ^ Scheele, Carl Wilhelm (1784). "Anmärkning om Citron-saft, samt sätt at crystallisera densamma" [Note about lemon juice, as well as ways to crystallize it]. Kungliga Vetenskaps Academiens Nya Handlingar [New Proceedings of the Royal Academy of Science]. 2nd series (in Swedish). 5: 105–109. ^ Graham, Thomas (1842). Elements of chemistry, including the applications of the science in the arts. Hippolyte Baillière, foreign bookseller to the Royal College of Surgeons, and to the Royal Society, 219, Regent Street. p. 944. Retrieved June 4, 2010. ^ Goldberg, Robert N.; Kishore, Nand; Lennen, Rebecca M. (2002). "Thermodynamic Quantities for the Ionization Reactions of Buffers". J. Phys. Chem. Ref. Data. 31 (1): 231–370. Bibcode:2002JPCRD..31..231G. doi:10.1063/1.1416902. ^ Silva, Andre M. N.; Kong, Xiaole; Hider, Robert C. (2009). "Determination of the pKa value of the hydroxyl group in the α-hydroxycarboxylates citrate, malate and lactate by 13C NMR: implications for metal coordination in biological systems". Biometals. 22 (5): 771–778. doi:10.1007/s10534-009-9224-5. PMID 19288211. ^ Maniatis, T.; Fritsch, E. F.; Sambrook, J. 1982. Molecular Cloning: A Laboratory Manual. Cold Spring Harbor Laboratory, Cold Spring Harbor, NY. ^ Gomori, G. (1955). "16 Preparation of buffers for use in enzyme studies". Methods in Enzymology Volume 1. Methods in Enzymology. 1. pp. 138–146. doi:10.1016/0076-6879(55)01020-3. ISBN 9780121818012. ^ Matzapetakis, M.; Raptopoulou, C. P.; Tsohos, A.; Papaefthymiou, V.; Moon, S. N.; Salifoglou, A. (1998). "Synthesis, Spectroscopic and Structural Characterization of the First Mononuclear, Water Soluble Iron−Citrate Complex, (NH4)5Fe(C6H4O7)2·2H2O". J. Am. Chem. Soc. 120 (50): 13266–13267. doi:10.1021/ja9807035. ^ Powell, Alvin (February 14, 2014). "59,000 generations of bacteria, plus freezer, yield startling results". phys.org. Retrieved April 13, 2017. ^ Blount, Z. D.; Borland, C. Z.; Lenski, R. E. (June 4, 2008). "Historical contingency and the evolution of a key innovation in an experimental population of Escherichia coli" (PDF). Proceedings of the National Academy of Sciences. 105 (23): 7899–7906. Bibcode:2008PNAS..105.7899B. doi:10.1073/pnas.0803151105. PMC 2430337. PMID 18524956. Retrieved April 13, 2017. ^ Stryer, Lubert; Berg, Jeremy; Tymoczko, John (2003). "Section 16.2: The Glycolytic Pathway Is Tightly Controlled". Biochemistry (5. ed., international ed., 3. printing ed.). New York: Freeman. ISBN 978-0716746843. ^ Hu, Y.-Y. ; Rawal, A.; Schmidt-Rohr, K. (December 2010). "Strongly bound citrate stabilizes the apatite nanocrystals in bone". Proceedings of the National Academy of Sciences. 107 (52): 22425–22429. Bibcode:2010PNAS..10722425H. doi:10.1073/pnas.1009219107. PMC 3012505. PMID 21127269. Retrieved July 28, 2012. ^ "Tissues that fight germs". CNN. July 14, 2004. Retrieved May 8, 2008. ^ "Pickling and Passivating Stainless Steel" (PDF). Euro-inox.org. Archived from the original (PDF) on September 12, 2012. Retrieved 2013-01-01. ^ Anchell, Steve. "The Darkroom Cookbook: 3rd Edition (Paperback)". Focal Press. Retrieved January 1, 2013. ^ "An Investigation of the Chemistry of Citric Acid in Military Soldering Applications" (PDF). June 19, 1995. ^ a b "Citric acid". International Chemical Safety Cards. NIOSH. September 18, 2018. ^ "Effect of Citric Acid on Tooth Enamel". ^ British Pharmacopoeia Commission Secretariat (2009). "Index, BP 2009" (PDF). Archived from the original (PDF) on April 11, 2009. Retrieved February 4, 2010. ^ "Japanese Pharmacopoeia, Fifteenth Edition" (PDF). 2006. Archived from the original (PDF) on July 22, 2011. Retrieved 4 February 2010. ^ This still does not make the lemon particularly strongly acidic. This is because, as a weak acid, most of the acid molecules are not dissociated so not contributing to acidity inside the lemon or its juice.